• excellent wear protection and fuel saving potential. 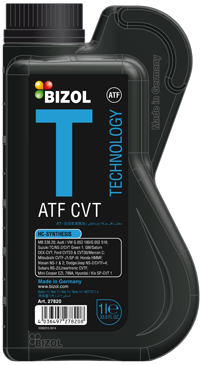 BIZOL Technology ATF CVT is a high-performance automatic transmission fluid developed specially for the latest generation of Continuosly Variable Transmission (CVT) gear boxes. Selected base oils and a well adjusted additive package protect against foam formation, which is very important for CVT gear boxes. The product has excellent antiaging and anti-oxidation characteristics. BIZOL Technology ATF CVT has been approved for the use in Autotronic gear boxes of the Mercedes A-and-B Class. It is also applicable in many variable automatic transmissions of different manufacturers, among others in Audi Multitronic.